Team Suzuki Press Office – November 26. 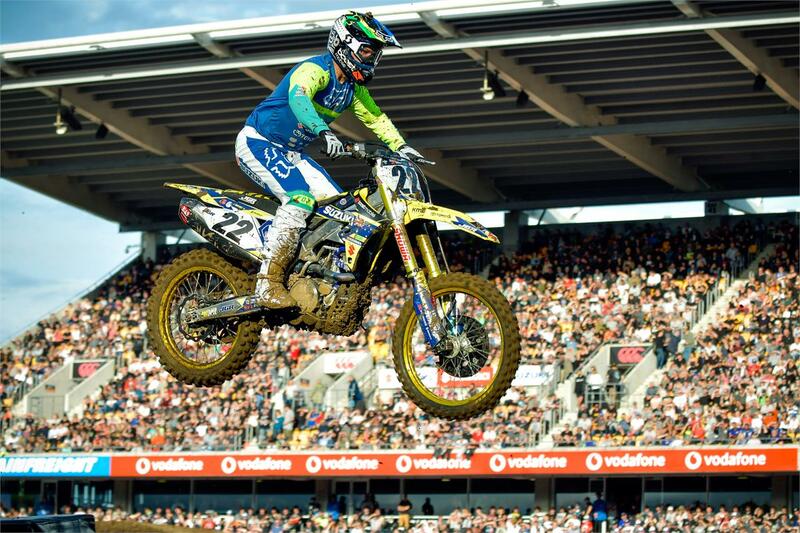 Suzuki’s Chad Reed is a three-time champion in America and now he’s the FIM Oceania Supercross Champion following his clean-sweep of the weekend’s inaugural Monster Energy S-X Open International Supercross FIM Oceania Championship in New Zealand. For the likeable Australian rider it was a welcome return to his ‘home away from home’ and a hat-trick of wins on Saturday night in front of a large and appreciative Auckland audience. Reed rode his Suzuki RM-Z450 to score an impressive unbeaten string of feature race wins in the premier SX1 class, delighting a crowd of more than 21,000 at Mt Smart Stadium. The man from Kurri Kurri in New South Wales, has been a many-time visitor to New Zealand over the years and he was the obvious crowd favourite on Saturday night, with the Penrose venue threatening to erupt each time he took the chequered flag. Reed made several trips to New Zealand in the 1990s, the young man keen to test himself before eventually heading to Europe and then the United States, where he went on to craft a brilliant international career. He finished runner-up in his first attempt at the 250cc motocross world championships in 2001 before twice winning the US supercross championships, firstly in 2004 and then again in 2008, and he also then won the 450cc motocross championships in the US in 2009. And there seems to be plenty more left in this ‘old man’ of the sport. “I’m 36 years old and I’m not supposed to be winning like this, at this level. Bring on A1 is all I can say,” said Reed, referring to the 2019 US supercross championship opener, set for Angel Stadium, in Anaheim, California, on January 5th. Saturday’s night’s spectacle was the second of two rounds in the FIM Oceania Championship, with the first round staged in Sydney two weeks ago, and it was Reed’s flawless performance in Auckland that propelled him to the top of the standings. He finished the night ahead of Australian Hayden Mellross, Scotland’s Dean Wilson and American duo Christian Craig and Justin Brayton, that result meaning Reed also topped the two-round FIM Oceania series, finishing that competition ahead of Wilson, Brayton, Australian Luke Clout and American Jason Anderson. He was up against some of those same elite US supercross riders at Auckland too. “You’ve got Justin Brayton who won a (US supercross) race this season and Dean Wilson was second in a (US supercross) race too. Christian Craig is one of those rising stars in the US, so for me to come here to New Zealand and dominate an event like this, it gives me a lot of confidence. In the SX2 (250cc) class, it was American rider Dakota Alix who took the glory at Mt Smart Stadium, finishing ahead of Australian Ryan Marmont, with New Zealand’s Josiah Natzke claiming the final podium spot, followed by Waitakere’s Ethan Martens and Te Puke’s Logan Blackburn.